Dogs are bringing comfort to families who lost a loved one in a fire that ripped through the Ghost Ship warehouse in Oakland late Friday night. 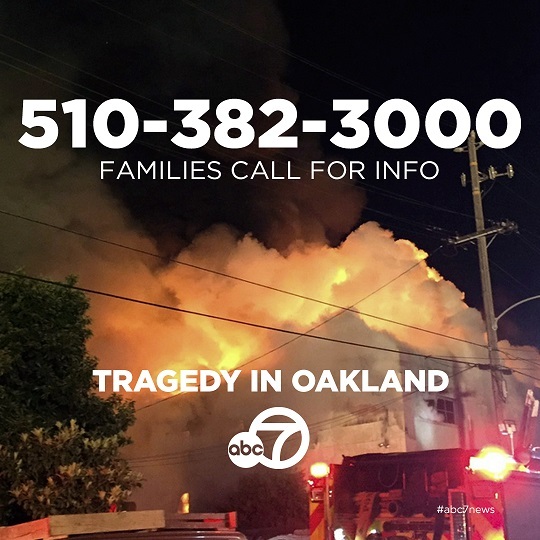 OAKLAND, Calif. -- Dogs are bringing comfort to families who lost a loved one in a fire that ripped through the Ghost Ship warehouse in Oakland late Friday night. Volunteers from the Valley Humane Society in Pleasanton brought their dogs Rosie, Posie and Sweep to the Family Assistance Center on East 12th Street in Oakland to help provide comfort to anyone in need. "They seem to know who needs comfort and who doesn't and they'll just walk up to someone and just lean against them. That's what the people need and they don't even know they need it a lot of the times, which is why the dogs are so valuable," Valley Humane Society volunteer Denise Laberee said. "The dogs are amazing, how perceptive they are. They go up to the people that are most in need," Valley Humane Society volunteer Debbie Wanlin said. The volunteers say the dogs show compassion and provide calm in a tragic, grief-stricken situation.